Welcome to the Booth House Gallery. We have a large collection of hand made studio ceramics. There are a few places left on our Ceramics Summer Course for August 2019! 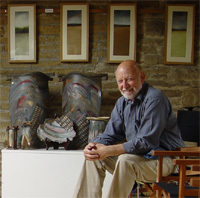 First opened in 1975 as a studio and sales outlet for sculptor and ceramicist Jim Robison, the gallery is housed in an early 19th Century barn with a unique queen post beamed ceiling. The warm coloured stone walls and wood floors are a perfect foil for ceramics of all kinds as well as paintings and other artwork. During the week please ring (01484) 685270 to confirm. We can often accommodate other hours! The gallery is a family business and there is always a warm welcome for customers and pottery enthusiasts. We also hold evening visits for larger groups by arrangement, and run week-long courses each summer. You can now buy Jim's books here - personally signed, as you would like, by Jim himself. Why not get them for yourself or for a ceramics enthusiast friend?